Presented by the Polish Armoured Train “L”. On this day as well there took place a Holy Mass. 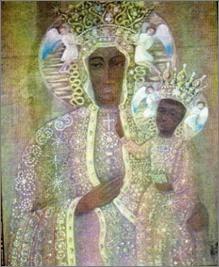 The donation of the picture to the Parish priest was the previous day. The Mass was offered by the crew to celebrate the occasion. After two days the Parish priest organised a special event for the blessing and presentation of the picture on the 30th May (Thursday) at 7.10 pm. The Parish priest informed our Commanding Officer that the Bishop of Aberdeen would bless the picture and there was an invitation for all the crew to attend. A grey image of the picture as it was in 1941. Outside of military duties, some Polish soldiers were keen to tell their Scottish hosts more about Poland. The example below is but one of many, many talks that were given by Poles about life in their country. These and many other educational, cultural and social events served to foster a better understanding between the Scots and the Poles. On 25th May 1941 (Sunday), Lieutenant Wenzel gave a second talk to a Scottish audience on the Youth Movement in Poland stressing the development of Scouting. The talk took place during a social gathering of 90 parishioners of the Ferry Hill South Church in Aberdeen. Photograph taken at the moment the pastel picture was presented to the church on 24 May. 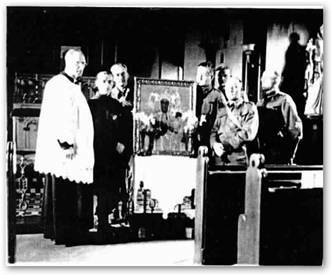 From the left, the priest of St Joseph's Parish, Father McLaughlin, then the train delegation comprising, Colonel Hackel (Commanding Officer), 2/Lt Mazur-painter of the picture, 2/Lt Martinek, 2/Lt Starzynski and Cadet officer Dr Frick and Rifleman Proch. Father McLaughlin served the parish from 1927 to 1952. The whole crew were fully appreciative of the work of 2/Lt Mazur who produced the pastel painting. Ceremonies connected with the picture took place, as the chronicle of the Armoured Train recalls against a background of air raids. During a night air raid the anti-aircraft crew of the armoured train fired at the enemy planes. The blessing was very special. After introductory prayers said by the Parish priest with the assistance of the assistant Parish priest and numbers of altar boys the Bishop entered in the splendour of his robes and holding a crook. He addressed the congregation in moving words of the importance of the celebrations to the local community. He spoke of the history of the picture and the martyrdom of the Polish Nation under German and Bolshevik occupation. He blessed the picture and thereafter blessed all who were there, presenting them with small crosses. 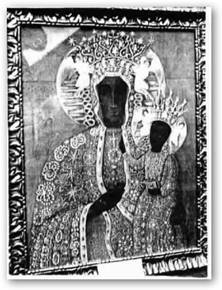 With rising emotion, the ceremony ended and while leaving the Church, parishioners approached the picture at the altar to say a prayer and get familiar with the inscription on a copper plate attached to the frame. After the ceremony, the parish priest invited present members to the hall for a modest refreshment. This ceremony became the best expression of feeling on both sides and the picture will remain a constant proof of the mutual spiritual and friendly relations between the Scottish people and us. This event led to a deeper relationship between the Polish soldiers and the local Parish priest who did his utmost to maintain contact between the parishioners and us. The proof of this was the running by the Parish priest of social evenings prior to the celebration. On the 18th May in the Church Hall, he arranged a musical dancing event where young Scottish children performed, assisted by one Scottish soldier playing the violin. A few days later our Parish priest offered to lend a piano which was very useful in our mess. It was not until November 1943, that steps were taken by a small group of wives and fiancees of Polish servicemen to form a branch in Aberdeen of the Scottish-Polish Society. Taking a prominent part in this move was Mrs Arnold Lachman (wife of a Polish soldier serving in the Middle East) of Richmondhill Place. It was hoped that when the branch was fully established that speakers would come to tell Aberdonians about Poland and that a centre be set up in the city where Polish servicemen could spend their leave and thus get to know the people of the area. Around the second week of October 1940, a Polish detachment of some 49 officers and 7 ORs took over this armoured train and began training. The unit was part of the 4th Armoured Train Group which consisted of three armoured trains, all of which were based in Scotland. Officers were quartered in hotels and privately. The armoured train patrolled the north east of Scotland area. In June 1942, the Polish crew handed over the train to a Home Guard battalion, the 4th LNER Battalion, a unit in the Aberdeen area.